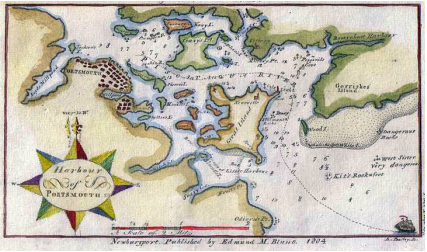 The large, well-protected harbor of Portsmouth, New Hampshire, on the Piscataqua River, was an important port in colonial America. It remains New Hampshire's only deep water port. Every future expiring cry of drowning mariner upon our coast will bitterly accuse the unfeeling Recusant that wastes life to save a paltry unblessed shilling. A wooden lighthouse was soon established at Fort William and Mary on Great Island, in what is now the town of New Castle in Portsmouth Harbor, about a mile from the mouth of the Piscataqua River. Construction began in April and the tower was first lighted on June 8, 1771. The shingled tower was about 50 feet tall and was topped by an iron lantern with a copper roof, with the light produced by three oil lamps made of copper. The first keeper was the commandant of the fort, John Cochran. It was the first light station established at a military installation of the British colonies of the present United States, the 10th of 11 light stations established in the colonies before the American Revolution, and the first lighthouse in the American colonies north of Boston. A lantern on a mast had been proposed at first but was deemed "impracticable." In December 1774, Paul Revere rode to Portsmouth from Boston to warn the colonists of British plans to reinforce Fort William and Mary. The colonists raided the fort and successfully made off with supplies. This is considered by some to be one of the first battles of the American Revolution. Ammunition taken from Fort William and Mary was used against the British at the Battle of Bunker Hill. The fortifications became known as Fort Constitution after the Revolution. The lighthouse has been known by various names: Portsmouth Harbor Light, New Castle Light, Fort Point Light and Fort Constitution Light. It appears that the lighthouse was not lit from 1774 to 1784, although it did serve as a lookout post in the defense of Portsmouth during the Revolution. In 1784, the tower was renovated and relighted. The lighthouse was transferred to the federal government in 1791, and in 1793 President George Washington ordered that the light be maintained at all times, with a keeper living on site. A new 80-foot octagonal wooden Portsmouth Harbor Lighthouse was constructed in 1804, 100 yards east of the 1771 tower on a spot called Pollock Rock. The contractor was Benjamin Clark Gilman, a native of nearby Exeter, New Hampshire, who was said to have "remarkable mechanical ability." The keeper had a difficult time with soldiers stealing his supplies and the sound of cannon fire from the fort breaking the dwelling's windows. In 1826, a fire started in the lighthouse lantern and spread quickly. The blaze was extinguished by the soldiers. The U.S. Treasury Department paid $20 to the company for replacement of their fire-damaged clothing. Engineer I.W.P. Lewis visited Portsmouth Harbor Light in 1842 and reported that the lighthouse was "an excellent piece of carpentry, and will bear favorable comparison with its more modern neighbors." Lewis also offered the opinion that the "height of the tower might be advantageously reduced to 30 feet." He pointed out that the light was not as important as it once was since the establishment of Whaleback Light in 1831. The tower was shortened to 55 feet in 1851, and the lighthouse was fitted with a fourth order Fresnel lens three years later. The keeper's house was relocated in the 1850s to a location near the remains of the Walbach Tower, a structure built in 1814 (near the present public parking area outside the gate to the Coast Guard staton). The present house was built in 1872 on the foundation of the previous house, and it has been moved twice to make room for Battery Farnsworth (1897) and Battery Hackleman (1906). Since 1906 it has been within the granite Civil War-era walls of Fort Constitution. A new 48-foot cast-iron lighthouse tower was erected in 1878 on the same foundation as the previous tower. In fact, the new lighthouse was assembled inside the old one, which was eventually removed. 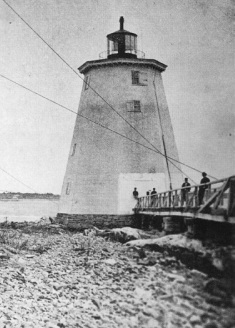 The new tower, which was designed by Army Corps Officer James C. Duane (Lighthouse Board Engineer for Maine, New Hampshire and Massachusetts, 1868-1879), held a fourth order Fresnel lens. The cast-iron segments were prepared in a Portland, Maine, foundry. 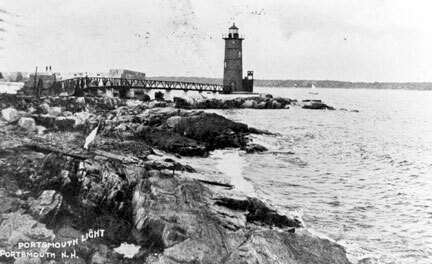 The cast-iron lighthouse was still rare in New England when the Portsmouth tower was built in 1878. The present tower is a handsome example of the durable, low-maintenance brick-lined cast iron lighthouses developed by the Lighthouse Board. Distinctive ornamental features not found on pre-1870s lighthouses are the Italianate hoodmolds projecting above arched window openings and the brackets supporting the iron-balustraded platform for the lantern which houses the light. The lighthouse was painted a reddish-brownish color until 1902, when it was painted white. 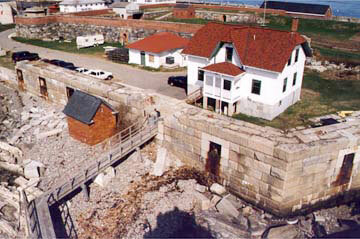 Right: The 1878 lighthouse and the 1860s-era walls of Fort Constitution. 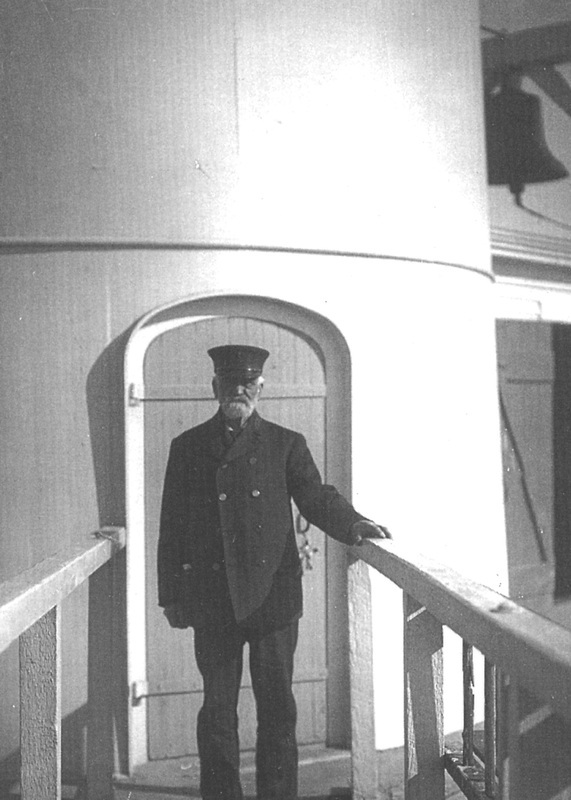 The keeper who served the longest at the station was New Castle native Joshua K. Card, who retired at age 86 in 1909 after 35 years at the station. When people would ask Keeper Card what the letter "K" on his uniform stood for, he'd tell them, "Why, Captain, of course." In all his years at the lighthouse, it was reported that Keeper Card left the station for an extended period only once. When he died in 1911, the Portsmouth Herald reported that Card "possessed a huge stock of common sense, was an acute observer, and a shrewd, yet fair-minded, judge of his fellow man. . . . It was a great treat to listen to him as he talked of the men and women of New Castle of the earlier days. . . . There was now and then a bit of quaintness in his speech, which gave you to understand that here was a man of rare powers of observation and expression." 1896 view. Note the fog bell on the side of the tower. This pre-1902 photo shows the present tower when it was still painted brown. The keeper's house had not yet been moved to its present location. Joshua K. Card is buried at the Riverside Cemetery in New Castle. Henry Cuskley became keeper in 1915 and remained until 1941. 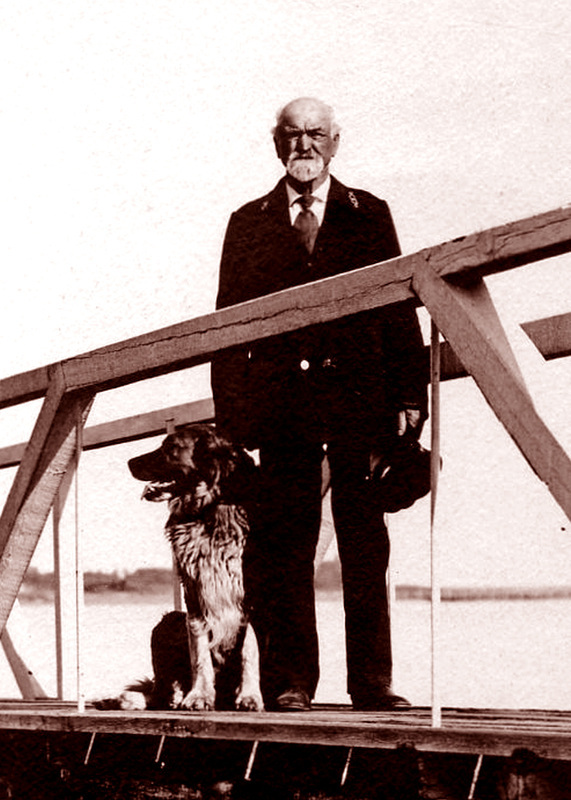 Cuskley lived at the lighthouse with his wife and two daughters. Mrs. Cuskley was famous for her Sunday dinners and raspberry custard tarts. One neighbor later remembered that Mrs. Cuskley would go into a panic when she got word that the lighthouse inspector was coming. The neighbor said that Mrs. Cuskley 'flew around wildly throwing things out the portholes, and I'd run out and catch what I wanted as it flew by. I have a small table today that I caught on the fly." One day, while Cuskley was keeper, the destroyer Brooks ran aground on the rocks near the lighthouse. It was refloated a few hours later. Left: Henry Cuskley, courtesy of Chuck Petlick. An 1896 fog bell is on display in front of the Coast Guard station. The bell was in use at the lighthouse until it was replaced by a horn in 1972. These finials on the tops of the balustrades on the lighthouse gallery show the fine ironwork on the tower. 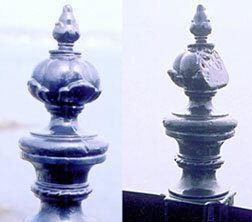 The finial on the right was damaged by lightning. Elson Small became keeper in 1946. Connie and Elson Small in the 1940s. I looked down forty feet to the little white scallops of incoming tide washing over the rocks, caressing each one lovingly. ...We could look up the Piscataqua River to Portsmouth, with its gleaming white belfry of North Church, a landmark for sailors, silhouetted against the sky. ...At the center of the harbor was Whaleback Lighthouse, and ten miles out to sea from that was the lighthouse on White Island, part of the Isles of Shoals. Both sent their beams across the water. In the video clip below left, shot when she was 97, of Connie remembered having electricity for the first time in 1946, after 26 years of life at offshore lighthouses. One of Connie's duties at Portsmouth Harbor Light was to fly weather signal flags, signalling mariners of storm or hurricane warnings. In the video clip below right, she recalled how she made use of the signal flags after they had been damaged by the weather. In March 2003, the Friends of Portsmouth Harbor Lighthouses named Connie Small "Honorory Chairperson." The light was electrified in 1925 and automated in 1960. A fourth-order Fresnel lens (not the original one) remains in use, covered by a green acrylic cylinder. The characteristic has been fixed green since 1941. Before the cylinder was installed, the light was produced by a green bulb. The lighthouse remains an active aid to navigation and is part of the Fort Constitution Historic Site, adjacent to an active Coast Guard Station. In 1998 the lighthouse was made "environmentally friendly" at a cost of over $73,000. The Coast Guard had all the lead paint removed from the exterior and interior of the tower, and it was then repainted. The work was done by Seacoast Diversified Inc., a contractor from Dover, New Hampshire. he Fresnel lens is encased in a green acrylic cylinder. Coast Guard Station Portsmouth Harbor. The main building was erected in 1967. Above left and right: Two views from the top of the tower. The 1903 oil house was abandoned for some years,but it was renovated in May 2004. The $5600 renovation was paid for by the New England Lighthouse Lovers. A full restoration of the building is planned. In early 2000 the American Lighthouse Foundation was issued a license to care for the lighthouse. A chapter of the foundation, the Friends of Portsmouth Harbor Lighthouses, was founded in 2001 to care for the lighthouse, the oil house, and the wooden walkway. Since 2009, the chapter has also cared for Whaleback Lighthouse in Kittery, Maine. The grounds of Fort Constitution are open to the public during the day, and there is a good view of the lighthouse from the fort. Visitors are not allowed into the area near the lighthouse, except during open houses held by the Friends of Portsmouth Harbor Lighthouses. The open houses are held every Sunday afternoon, 1 to 5 p.m., from Memorial Day weekend in May to Columbus Day weekend in October. 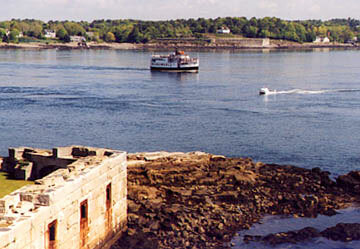 Portsmouth Harbor Light, the only mainland lighthouse on New Hampshire's 18-mile seacoast, can also be viewed from tour boats leaving Portsmouth. Keepers: John Cochran (1771-1774); Mesech Bell (1784-1786); Titus Salter (1786-1793); David Duncan (1793-1820); Allen Porter (1820-1839); Nathaniel Marston (1839-1841); Edward T. Yeaton (1841-1843); Joseph E. Robinson (1843-1846); John Kennard (1846-1849); William Vennard (1849-1853); Thomas Marston (1853-1858); Richard R. Locke (1858-1861); Elias Tarlton (1861-1866); John H. Campbell (1866-1874); Joshua Card (1874-1909); Thomas Jackson (temporary keeper, 1909); Leander White (1909-1915); Henry Cuskley (1915-1941); Charles U. Gardner (relief keeper, c, 1942-1943); Arnold White (1942-1946); Elson Small (1946-1948).